Throughout November and December, promotions will be involved in our daily life. All kinds of little promotions and huge promotions will be offered by retailers. Among them, Black Friday and Christmas promotion must be the most famous but also the grandest one in the western countries. In 2015, Black Friday has brought $633.8 billion in economic growth and more than 74.2 million people shopped on Black Friday. Similarly, there is also a grand promotion called Double Eleven Shopping Carnival whose sale scale is comparable to Black Friday’s. Actually, Double Eleven originates from Singles Day which is originally claimed as a celebration on November 11 every year for China’s young singletons. And it was in 2009 that it was turned into a shopping bonanza. During the Double Eleven Shopping Carnival, all the online shopping websites will provide a big shopping carnival for consumers. Now, physical stores also add to the line of celebrating this shopping feast. In 2016, Double Eleven Shopping Carnival brought a turnover of more than 100billions to one of online shopping giant of China and brought 657million logistics orders on November 11th, 2016, which broke the world record. At present, the Double Eleven is not only for Chinese consumers but also for those from all over the world. Last year, 11.11 Shopping Carnival also happened in 256 countries in the world, which brought great enjoyment to the world consumers. 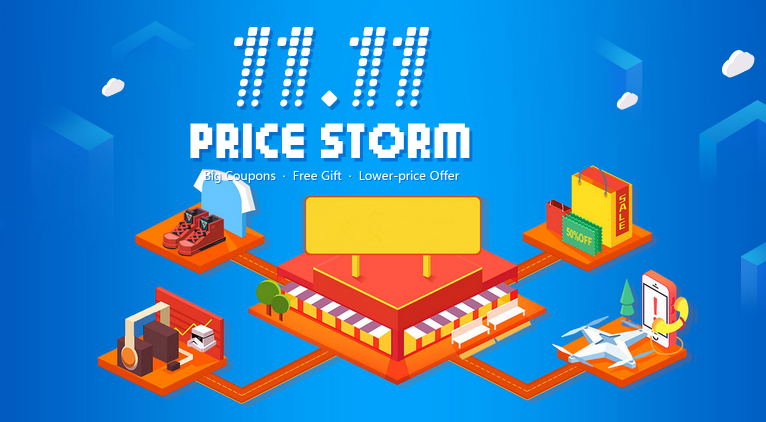 As Double Eleven Shopping Carnival approaches, Banggood which is one of the largest e-commerce in China is gonna to launch its Double Eleven Shopping Carnival for you from November 11th to November 12th. Actually, it has begun on October 23rd with the part called warming up, along with a series of sales activities. But the most important is Double 11 Shopping Carnival in which 24-hour flash deals, snap-ups, wonderful coupons are available in every category. Although Banggood is a very young e-commerce body, its Double Eleven Shopping Carnival also deserves your expectation. In recent years, Banggood has made a great progress in the product quality, customer service, and business scale. Until now, millions of people from all over the world have added to the customer base of Banggood and 2000 full-time employees have added to Banggood. All of these will greatly contribute to the ongoing of Banggood Double Eleven this year. The holiday promotions, whether Black Friday or Double Eleven Shopping Carnival, have satisfied the need of shopping of people from all over the world every year. As one of the organizers of them, Banggood will never stop its step to improve itself in order to provide the best service for you.